Still Haven't Switched Over To The New Platform? In case you haven't heard, we have made the switch to a new giving platform called Simple Donation. The switch was made in order to continue improving our stewardship of the money we receive through general offering, missions, and event registrations. 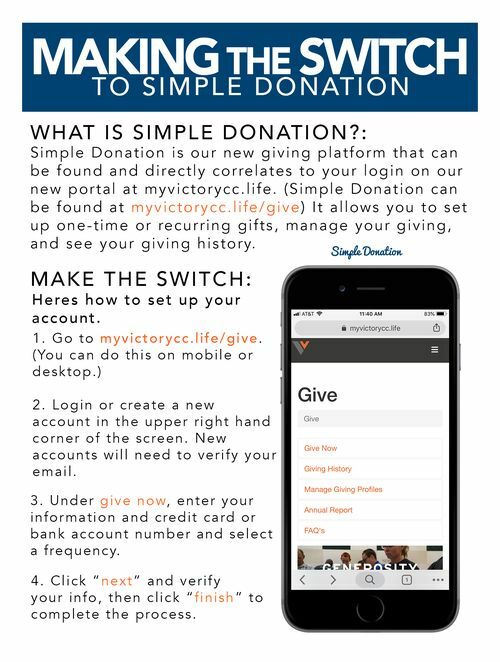 In addition, the switch directly correlates to our new portal site, myvictorycc.life which can now tie your giving to your profile in the portal. We get it, some of us don't like change, but making the switch to Simple Donation, doesn't have to be difficult! In fact, it's quite, well...SIMPLE! And after you make the switch, you'll be introduced to the benefits of our new portal site and we promise you will love how integrated it is with your giving profile! You can also watch the video below if you need a visual demonstration! If you still need help with making the switch, please email our Communications Director here or call the church office at 317-736-8364. *PLEASE NOTE: Once switched, you cannot actually fully cancel your Kindrid Giving account. You can cancel your contributions through Kindrid (take them to 0 or cancel your recurring gifts), and that will cancel your giving through Kindrid. Once we get everyone switched over to Simple Donation, our canceling of Kindrid will cancel all accounts that existed in Kindrid Giving. To access your Kindrid giving to cancel it, click the button below. We hope to be switched over by the end of February. Get started now at myvictorycc.life/give!